Magpie Salmagundi: "I'm glad we stayed home yesterday"
The title of this post was Michael's comment when he forwarded the CNN article pasted below. Labourers carry a fake coffin as they march towards the presidential palace during the May 1 rally in Jakarta. Jakarta, Indonesia (CNN) -- Workers clogged the streets of the Indonesian capital on Sunday, chanting, "wages, land and jobs," and demanding the resignations of the nation's president and the vice president. Protesters clashed with police during the May Day rallies in Jakarta as they pushed their way toward the presidential palace. When workers reached the front of the heavily-guarded palace, they burned tires. 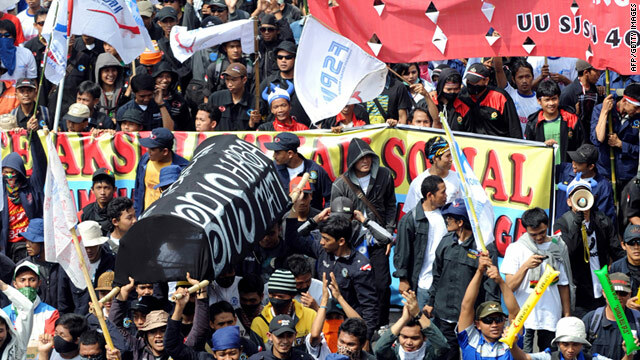 At least 66 labor groups joined the protests, according to Syawal Harahap, an Indonesian metalworkers' union official. Organizers had said earlier that about 50,000 workers would attend, though it was unclear how many protesters turned out. The workers demanded higher minimum wages, an end to outsourcing by companies, union rights and the implementation of an already-legislated social security system for all Indonesians. Thousands of workers hold protests every year on May 1 and often scuffle with the security personnel near the presidential palace. President Susilo Bambang Yudhoyono was not in the palace when protesters reached its entrance. He was scheduled to visit two factories just outside of Jakarta. Protesters called for the resignations of Yudhoyono and Vice President Boediono. Indonesia has no national minimum wage. Regional governments set the minimum wage in their own provinces or districts. About 7,000 police officers were deployed for Sunday's rallies, Jakarta police said.